A lively, entertaining history of American fun. Notwithstanding its obvious subjectivity, the definition of “fun” has changed significantly since early American colonization. Yet Beckman (English/U.S. Naval Academy; The Winter Zoo, 2002) is undeterred by the challenge of drawing out what he believes to be a uniquely American idea of fun as an act of rebellion. Using a cast of familiar characters—Samuel Adams, Ken Kesey, Mark Twain—as well as lesser-known Americans—Thomas Morton, King Charles and Buddy Bolden, to name a few—Beckman argues that it is quintessentially American to participate in pranks and tricks. (The Boston Tea Party is a prime example.) 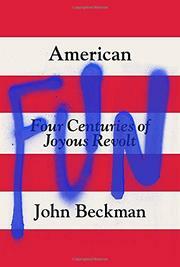 For Beckman, it is this “boldness in the face of adversity and restraint” that characterized early American fun. It was social, political and, above all, daring, and it represented an appeal to the democratic principles that would come to define the still-maturing republic. But, as “fun” became more popular, Americans were quick to exploit the economics of leisure. Fun was now a matter of entertainment—“Barnumization,” as Beckman puts it—a big business that no longer relied on prankster risk. “These pleasures were fleeting and superficial—by design,” he writes. “Nothing was at stake, except the ticket price.” These two strands of fun continued to develop in parallel, defining their respective ages, from Jazz Age exuberance and the subversive counterculture of the 1960s to 1980s hypercommercialization and today’s digital zombie-ism. While there is no shortage of irreverent and diverse examples that key in on various stages of fun’s development in America, Beckman is often so diffuse in his breadth that his argument seems to be lost. His conclusions, moreover, slide dangerously close to exceptionalist rhetoric. Are Americans the only people that partake in such revelry? Nevertheless, he does identify uniquely American experiences that define a collective understanding of fun as a protest against the established order, even if one is a part of that order. With a novelist’s care for detail and storytelling, Beckman offers a remarkably expansive, if flawed, cultural history.